Reed Krakoff set a new benchmark in American elegance with his Autumn/Winter collection - the first since reclaiming control of his eponymous label from Coach. The designer celebrated a fresh independence with a stunning sequence of luxurious pieces, such as pony hair and viscose dresses, python wrap skirts and intricate gold collage dresses, which delicately moved with every turn. Krakoff's graphic eye was demonstrated by his use of contrasting colour, either as solid waistbands, pencil-thin black stripes that traced one side of the garment or triangular panels interjected in the more textured pieces. The silhouettes had a relaxed, easy feel, with wrap skirts nonchalantly slung around waists with loose sashes, or thin black cords. 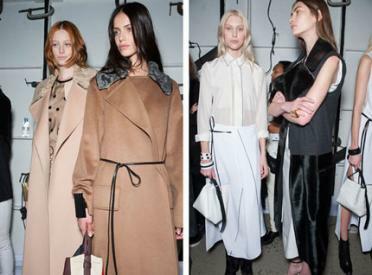 Even outerwear, which took on a predominantly elongated shape, were loose and hung off the shoulders just so. Of course, Krakoff being Krakoff, the accessories were no slouch. The designer not only seduced us with his 'Krush' bag - a ladylike pochette handbag that oozed cool with its utilitarian strap - but also with strappy closed-back sandals, Oxford boots and statement cuffs and rings to boot. Clean, yet glamorous, each look had us wanting more.